The melting of glaciers on one side of the globe can trigger disintegration of glaciers on the other side of the globe, as has been presented in a recent paper by a team of AWI scientists, who investigated marine microalgae preserved in glacial deposits and subsequently used their findings to perform climate simulations. The study highlights a process with alarming consequences for modern ice sheets—continuous warming of the ocean can result in a massive loss of polar ice mass, and consequently to rapid sea level rise. Ocean basins around the world are interconnected by large-scale current systems, and like a global conveyor belt, the currents transport water around the globe at varying depths. The resultant distribution of warm and cold water masses is critical for global climatic conditions. Scientists at the Alfred Wegener Institute, Helmholtz Centre for Polar and Marine Research (AWI) and MARUM Center for Marine Environmental Sciences have now documented how a change in currents in one ocean basin can trigger massive and unexpected changes in a distant basin, even on the other side of the planet. The Bremerhaven-based researchers report in the journal Nature that during the last glacial period, a massive inflow of freshwater into the polar North Atlantic set off a chain of events in the ocean and the atmosphere, which resulted intensive glacier melting in the North Pacific, thousands of kilometres away. The source of the freshwater was melting ice sheets, which covered land masses surrounding the North Atlantic during the glacial period. At the end of the chain of events, warm water penetrated the Pacific coastal area of the North American continent, which was also covered by an ice sheet. As a result, parts of the sheet disintegrated and were released into the Pacific as large-scale flotilla of icebergs. Considering that the modern ocean is warming continuously as a result of global warming, this finding is alarming for the AWI scientists. Comparable to the process observed in the eastern North Pacific during the last glacial melting, the ongoing ocean warming may disintegrate Antarctic ice, which subsequently would result in a significant sea level rise. Together with a team of scientists, AWI geoscientist Edith Maier describes a complex stepwise process. First indications were gathered from sediment sampling during an expedition with the German research ship Sonne 600 kilometres off the coast of Alaska. The recovered glacial sediment layers of up to cobble-sized stones, which originated in the distant continental land. The only feasible explanation: the stones must have been transported while incorporated within icebergs into the open North Pacific Ocean when the North American coast was covered by an ice sheet. Confirmation came from the dating of the layers, which reveals that the stony layers were deposited around 16,000 and 38,500 years ago, during the last glacial period. "Accordingly, we assume there were two major melting events in the North Pacific realm," says Edith Maier. To test this thesis, the team employed an innovative analytical technique pioneered at the AWI. The method uses diatoms to determine how intensively the salinity of ocean surface waters has declined, e.g., due to meltwater deposition. By performing an oxygen isotope analysis on the remains of the siliceous parts of diatoms preserved in the sediment record, the researchers were able to identify at what times the surface salinity was most intensively affected by melting ice. "In fact, our analyses showed that there were major inflows of freshwater into the area south of Alaska roughly 16,000 and 38,500 years ago," confirms Edith Maier. Previous reconstructions of glacial conditions have documented that meltwater inflows have caused major drops in surface salinity in the North Atlantic, a feature that inspired Edith Maier to investigate whether the meltwater events in the North Atlantic and the North Pacific were linked via the global water circulation. Today, warm surface water is transported from the Pacific to the Indian Ocean, then flows around the southern tip of Africa towards the Caribbean realm and then spreads into the North Atlantic via the Gulf Stream. The driver of this global flow is the generation of cold and salty water in the polar North Atlantic. This water, produced during ice formation, is denser than warm water and therefore sinks into the deep ocean. As a result, the surface warm water is pumped to the North. But 16,000 and 38,500 years ago, the global "pumping system" was seriously disrupted by the decreased salinity of the North Atlantic. Consequently, only little warm water flowed out of the Pacific, causing the tropical Pacific to get warmer. In turn, more warm water reached the western coasts of Canada and Alaska. The inflow of warmer water destabilized the ice sheet covering the coastal areas which resulted in a discharge of the continental ice into the ocean and a drop in surface salinity. To validate this scenario, Edith Maier asked the AWI's climate modelers, led by Gerrit Lohmann, whether such a complex, global chain of events could be simulated using computer models. The results were unequivocal: If the oxygen isotopes are taken into account, the models clearly show that the phenomenon occurs. The model results also show that meltwater pulses in the Atlantic caused the changes in the Pacific—and not the other way round. "Our findings are also relevant for the future, because they highlight that climate effects on one side of the Earth can significantly impact regions on the opposite side," says Edith Maier. 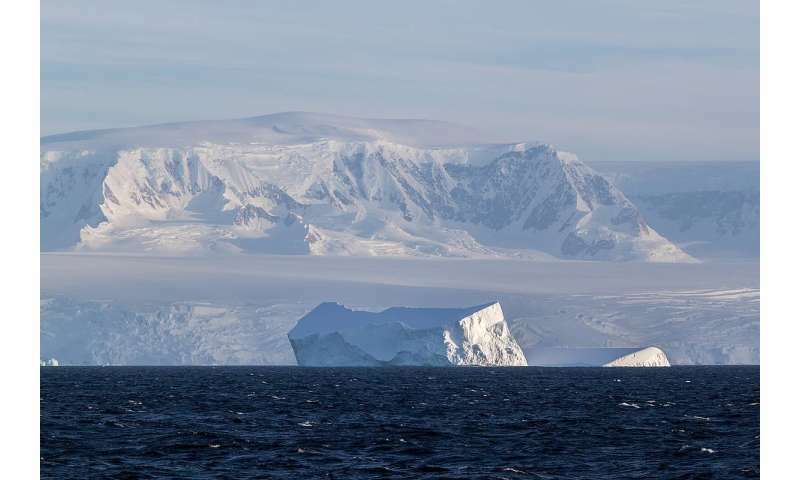 "The AWI is currently exploring how similar phenomena involving the inflow of warmer water are now affecting the stability of the Antarctic ice sheet. There is increasing evidence suggesting that further ocean warming will jeopardise both the stability and volume of the Antarctic ice."